Kaporal was founded in 2003, the brand has proven itself in the fashion industry by its jeans and is now appreciated for its belts collection. With their unique and contemporary look, the Kaporal belts earned a strong reputation among the public. 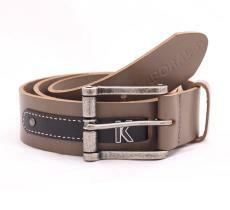 Kaporal belts remind us of vintage, and the collection is based on the American spirit, Hawaii, motorcycle, army, pin up. Kaporal belts are the extension of the jeans collection, the brand is much appreciated by the young designers. Since 2003, it’s all the rage and is distributed all around the world. This French brand proposes quality leathers, and a good style of its own, and such a remarkable look knocks hard in France as well as over the world.